DVD/BR | personal.amy-wong.com - A Blog by Amy Wong. I just posted my 350th review, Jigarthanda [also in Español], which happens to be my 30th (sorta) Indian film review. So~ commemorating! Here’s a list of my first 30 Indian film reviews. You can actually see how my journey  has shaped up from DDLJ, KKHH and K3G YRF, SRK (and Kajol, though I posted her reviews later on) and Karan Johar-centric to Bhansali, Rani, Vidya, Madhuri, alternative Hindi cinema to regional stuff. 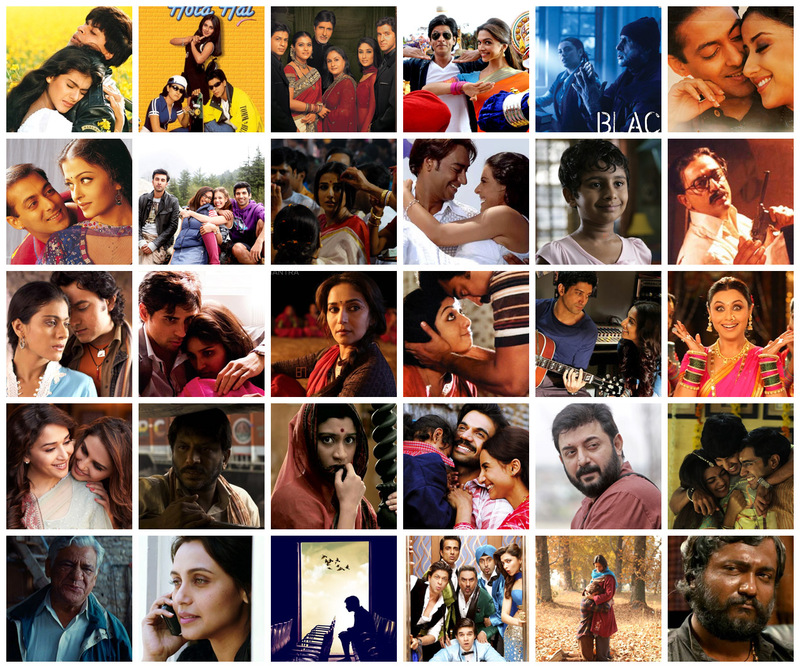 And if you want to keep track of my reviewed Indian films, go here: English, Español. Oldie song, but new performance at… what seems, the Bird Nest Stadium in Beijing. Mayday has just released the Nowhere Concert Movie in four editions: 3D BR + Live in Live Making-Of the concert DVD, Simple BR, Free Region DVD, and the DVD with the Making-Of. They’ve also re-released their albums in Chinese versions, and I’ve seen (super expensive) Vinyls, as well. I still can’t believe Asian Blurays are so expensive compared to their US counterparts. Now we all gotta way for Asian movies to be released in America. 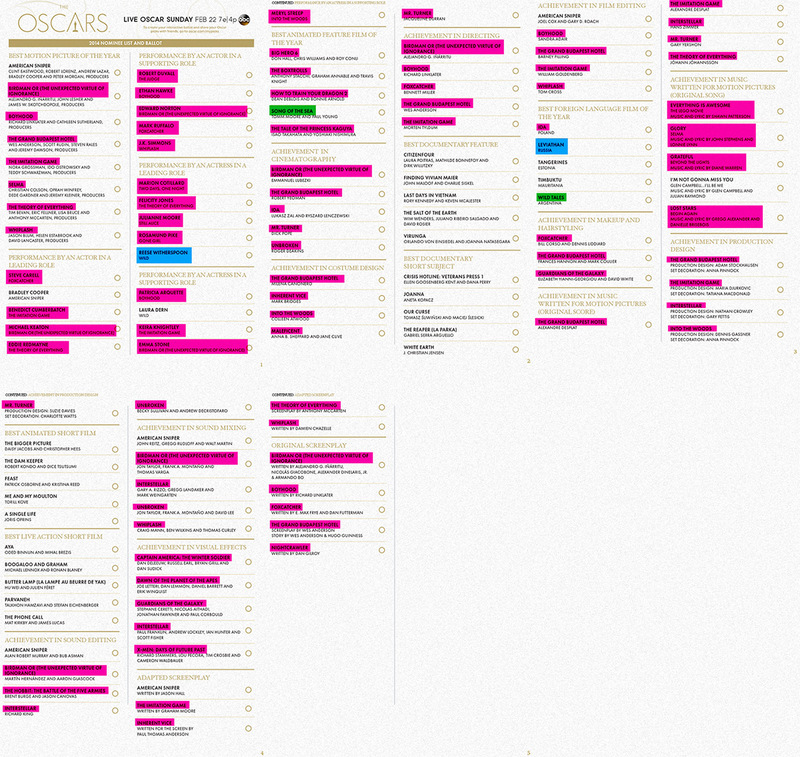 Except for the mandatory appreciation for Boyhood (the Patricia Arquette show) and Whiplash, which had me contorting from all the conflictive feelings, I’m feeling rather lukewarm with this year’s award season as you can see from my 2014 Films Ranked compared to my Academy Award Watchlist. Hot pink is watched, light blue on to-watched queue, highlighted in green haven’t been found yet. My excuse for lack of documentaries and shorts is because of access. I find them extra difficult to get. Also, any respectable award show needs the presence of Haider. LOL And I could do a LOT LESS from Clint Eastwood. I’m not even one of those complaining for lack of women behind/in front of the camera, the nominees are just so damn BLAH! except for the few couple of surprises- some spice with Marion Cotillard (even though I don’t feel strongly about the movie), Ida and Mr. Turner in cinematography… and The Tale of Princess Kaguya. It’s End of the Year Voting Season! Oh, who am I kidding. What I love about the end of the year is all the Best Of lists, rankings and voting. Expect my annual Top50 Songs of 2014, My fave movies of the year, and My fave local 2014 releases. I might even have enough material for a 2014 Music Highlights. We started voting early on the YAM Magazine lounge because we are all lobbying for our favorite films, and prepping our personal End of the Year lists. 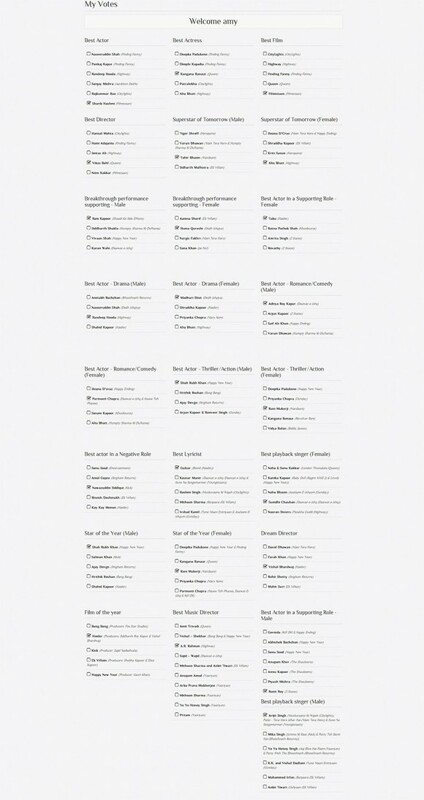 I’m the most serious of all because lists can only matter when you grab the biggest possible sample. Not watching Indian movies meant that I wasn’t watching roughly 30-35% of the worldwide output. So this is my first year online voting for Indian movies! I actually kinda like how MANY categories there are for actors to get a nod. LOL They don’t always make sense (Superstar of Tomorrow, hahahahaha and the Male Thriller/Action is quite rubbish), but I’m generally happy when I get to vote for Tabu, Madhuri and Rani without much conflict. So~ YEAH! A country bumpkin (with a heavy Shandong accent, I suppose… with my level of Chinese, I can’t tell.) and a cow are the only survivors of a terrible Japanese airstrike during the Sino-Japanese War. I never thought I would ever say this, but that’s the best damn cow performance I’ve ever seen in my life. 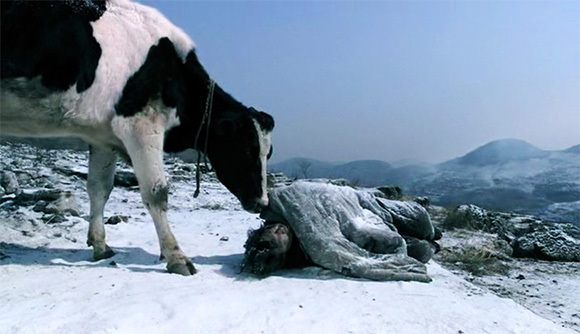 Alongside Dolly (the dog performance in Korean film Blind), it might be one of my favorite animal performances on film. Even though it didn’t slay in any categories in my Best of 2013 post, The Chef, The Actor, The Scoundrel (厨子‧戏子‧痞子) was one of my favorite movies last year. After Cow (斗牛, Dou Niu), I’ve become a Guan Hu and Huang Bo fan.